The national question is a theme that is hotly debated in Russian politics, with proponents of ethnic and civic models battling it out. As in Western Europe however, it is the civic version that is dominant, and Russia possesses its very own variant of multiculturalism. What makes the national question such a live issue is the relative demographic decline of ethnic Russians which is paralleled by a surge in immigration from nearby Muslim states and higher birth rates amongst Muslim indigenous ethnic groups within Russia. Violent Islamism continues to bedevil the country and over the past decade the DPNI (Movement Against Illegal Immigration) has sprung up to address concerns about the mass influx of non-Russians. Presidential contender Vladimir Putin evidently thinks that votes are to be won by touching upon this theme, for he has just published his thoughts on the national question in Russia (see the forthcoming article ‘Russia and the National Question: Putin the Patriot?’). According to Kavkazskii uzel, additional information suggests that “on one side were local residents aged 25 and 19, on the other, seven students from the technical university, having come from Ingushetia to study. Almost all of the students were of the same age: namely 19.” The fight is said to have been sparked by a slanging match that arose between the two. The local authorities are concerned by this incident because it is not an isolated case. Kavkazskii uzel notes that there have been recent mass brawls in the city and elsewhere in the Rostov District, notably on 2 January when a 38-year-old died of a chest wound and three others were hospitalised; four were hospitalised with serious injuries following a violent ethnic clash in Rostov-on-Don’s Lenin Square in August last year; last July two dozen people were injured (nine hospitalised) in the hamlet of Mel’nikov in the inappropriately named Veselovskii (literally ‘cheerful’ or ‘merry’) region, and another fight between students broke out in the port city of Taganrog on 9 February 2011. 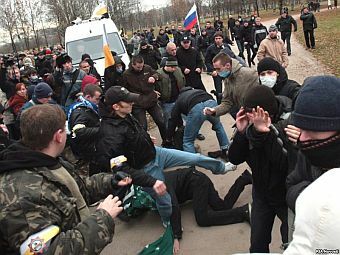 The wounding and subsequent death of Russian student Maksim Sychev by an Ingush student named Khazbulat Markhiev at the Rostov State Construction University at the end of November 2010 caused uproar in Rostov. On 12 December that year a protest was held that attracted some 2,500 participants bringing together “students, football fans, national-patriotic and other informal opposition bodies”. Markhiev was later charged with bringing about Sychev’s death through inflicting “traumatic brain injury” for which he received a three-year sentence. Taking into consideration the aforementioned context, it can be no surprise that the atmosphere in Rostov must therefore be rather tense. The question that naturally poses itself is this: are these incidents unrelated, or are they symptomatic of something more worrying in the state of Russo-Ingush ethnic relations? I can only conclude that whatever left the above 'comment' is neither English, Russian nor Ingush. What is it? Is it even fully human? I've seen more sensible comments made by chimps using sign language. Russia has its problems and they are only going to get worse. As you've said, their 'own' population is declining, they are suffering Islamic immigration and many of the satellite countries are highly Islamic. Communism, held it back, tough leaders like Putin held it back. But some time the cultural Marxists are going to get someone into power, they must be doing what they do in the West. Taking over the education system, the judiciary, the media (BBC), local government/councils and to an extent the police. I suspect that Russia is a least one country where the population would put up a fight and civilian war is possible. Not like here, we're just going to bend over and take it, until we're like the Copts of Eygpt or the many other countries where non Muslims have become a persecuted minority. You're right Road Hog that paradoxically in many respects Communism within the Soviet Union actively encouraged ethnic nationalism, albeit superficially in accordance with the dictum "National in form, socialist in content." Stalin certainly saw it as indispensable in mobilising support in defence of Mother Russia in WWII, for it reached the popular sentiment that appeals to the 'Revolution' could not. As for Putin, well, hopefully when I have time I'll get around to explaining my thoughts on his position. Comments that call for or threaten violence will not be published. Anyone is entitled to criticise the arguments presented here, or to highlight what they believe to be factual error(s); ad hominem attacks do not constitute comment or debate. Although at times others' points of view may be exasperating, please attempt to be civil in your responses. If you wish to communicate with me confidentially, please preface your comment with "Not for publication". This is why all comments are moderated. One Million Muslims to march in London? David Cameron’s Speech on Multiculturalism: a Damascene Conversion? Thank you Comrade Abbott for our happy Childhood!